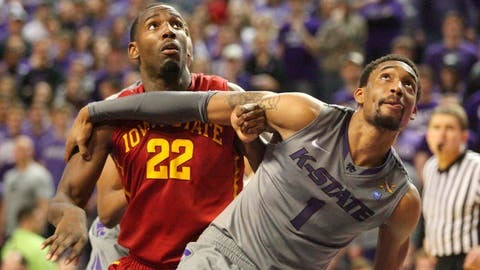 Wildcats guard Shane Southwell scored 13 points to help K-State beat Iowa State to extend its home winning streak to 15. MANHATTAN, Kan. — Finding effective substitution patterns has been a source of frustration for Kansas State coach Bruce Weber and his assistants. A few heated discussions have taken place, but they might have found their answer against No. 15 Iowa State. Behind a 38-2 advantage in bench scoring and Will Spradling’s tiebreaking 3-pointer with 1:38 left, the Wildcats overcame a huge game by Cyclones star Melvin Ejim in an 80-73 victory Saturday night. Kansas State (20-9, 10-6 Big 12) had five players in double figures and seven with at least seven points. "We’re not skipping a heartbeat when the second group comes in," Thomas Gipson said. "D.J. (Johnson) plays extremely hard and sometimes he plays harder than me. It gives our team a boost of energy and people want to play harder." Shane Southwell had 13 points for the Wildcats, who moved into a four-way tie for second place in the conference with Iowa State, Oklahoma and Texas. Trying to earn the No. 2 seed in the league tournament, they play at Oklahoma State on Monday and then host Baylor on Saturday to end the regular season. Kansas State has beaten the three teams it is tied with, which could help if tiebreakers become necessary. The Wildcats also have won 15 straight games at Bramlage Coliseum, their longest home winning streak since the 1981-82 season. Ejim had 30 points and 16 rebounds, and DeAndre Kane added 24 points and eight rebounds to pace the Cyclones (22-6, 10-6). A 12-point first half from Southwell was a welcomed sight for the senior as he broke out of a monthlong slump. His 13 points were his most since scoring 14 at Iowa State on Jan. 25. Behind a 16-0 run, the Wildcats opened a 20-9 lead with 10:44 left in the first half. Ejim, the Big 12’s active leader in career double-doubles, got his 31st by halftime with 14 points and 10 rebounds. "He really struggled in his last game and only played 20 minutes," Cyclones coach Fred Hoiberg said. "But we stepped up in his absence and got a big win despite him being on the bench for half of the game. His energy was off the charts tonight. To go out and have 30 and 16 on the road is a pretty big-time performance." Ejim and Kane answered the Kansas State run with 28 first-half points while cutting the deficit to 39-34 at the break. As the "Big Three" for the Cyclones, Ejim, Kane and Georges Niang all came in with scoring averages above 17 points in conference play. Although two of the three lit up the Wildcats’ defense, Weber was happy with his team’s effort. "They had two special players in that arena with Ejim and Kane," Weber said. "Both of them are up for being the top players in the league. They’ve had the big three all year and we did the job on Niang. Some of it was getting him in foul trouble, which helped." Foul trouble plagued the Wildcats, too, as Spradling and leading scorer Marcus Foster sat out much of the first half with two fouls. "We had some unconventional lineups in there," Weber said. "But they didn’t go down. They kept battling." Foster ended the first half with two points on the opening basket of the game and finished with 11. Gipson and Johnson both scored 12 for Kansas State. Ejim, the Big 12’s leading scorer with an average of 18.4 points, opened the second half with a three-point play. Kansas State pushed its advantage to five before the Cyclones rallied to take their first lead in nearly 23 minutes. But the Wildcats answered in the closing minutes, and Spradling’s 3-pointer with 1:38 remaining gave them a 72-69 edge they did not relinquish. "Their two shooters made big shots when they needed them," Hoiberg said. "Spradling came off after struggling and knocks a big one down. Foster did the same thing the next time down. That’s what great players do, a four-year player in Spradling and one of the best freshmen I’ve seen in a long time in Foster." Kansas State closed it out with six free throws in the final 1:23. "They came right back and hit some big shots," Ejim said. "We played hard, guys came in, stepped up and made some big shots, but truly they were able to make some big shots down the stretch and make some stops."